Low profile support brace for the CMC joint. 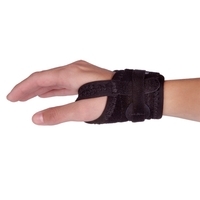 Places the thumb in the optimum position by simultaneously abducting the thumb and seating the CMC joint. Pressure dot provides support to the CMC joint. Universal: fits both the right and left.